Timothy Phelps knows virtually all there is to know about adorning hot-rod cars with flames. He knows the pioneers of the craft -- George Barris, Von Dutch, Rod Powell, Ed "Big Daddy" Roth. He's conversant with all the fiery motifs -- flames within flames, "shadow" flames, "ghost" flames, patterns with names like Crabclaw, Streamer, and Seaweed. 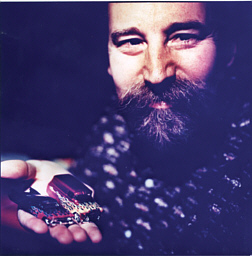 He's painted more than 400 cars himself -- really small cars. As assistant director of Art as Applied to Medicine at the Johns Hopkins School of Medicine, Phelps illustrates the body's organs, arteries, bones, and sinews. In his spare time, he paints 3-inch-long cast-iron models, all done in the flaming regalia that began showing up on the hot rods of southern California in the 1940s. "Most of the work I do during the day is somewhat confining because I have to stay true to anatomy," he says. "In the evening, I can just let my brushes go wild." He says, "You look at these cars and shake your head and wonder, How did they do that?" You could ask the same of Phelps' models. He disassembles each miniature, strips its paint, then sketches the style of flames that accords with the car's lines. Next he cuts tiny masks that he applies to the car, and airbrushes the flames. Finally -- this is the remarkable part -- he outlines the tiny flames with tinier pinstripes. Each car takes him eight to 10 hours to complete. Phelps painted many of them for his book Miniature Molten Magic, which will be published this spring by Airbrush Action Publishers. Of the two cars below, he says, "The dark blue rod is a '59 Cadillac coupe with Tribal flames, a new variation based on Polynesian, tribal, and Celtic influences. The little ruby-colored cruiser is a '57 Chevy Suburban with traditional flames popularized in the mid-'50s by Rod Powell."